There are times when a business doesn’t do anything legally wrong, but its actions leave a bad taste in the mouths of consumers. We’ve got one of those cases today. It’s all about the billing practices of a hospice care facility. The daughter of one patient was so disturbed by its practices upon admission that she reached out for help. While the billing practice is clearly spelled out in the contract and is not covered by any law, we spoke to hospice experts who said the practice is not common in the industry. We also spoke to a couple of state legislators who, upon hearing the family’s story, decided to draft legislation to ban the practice in New Jersey. Let’s start with the patient, Ida Shaw. She was the kind of lady who liked to joke around with younger folks. And she liked to dance. Everywhere she went, she’d ask strangers to guess her age, her daughter, Margaret Shaw, said. Her daughter said Ida lived by herself, cooked her own meals, and she drove her own car until she was 94. 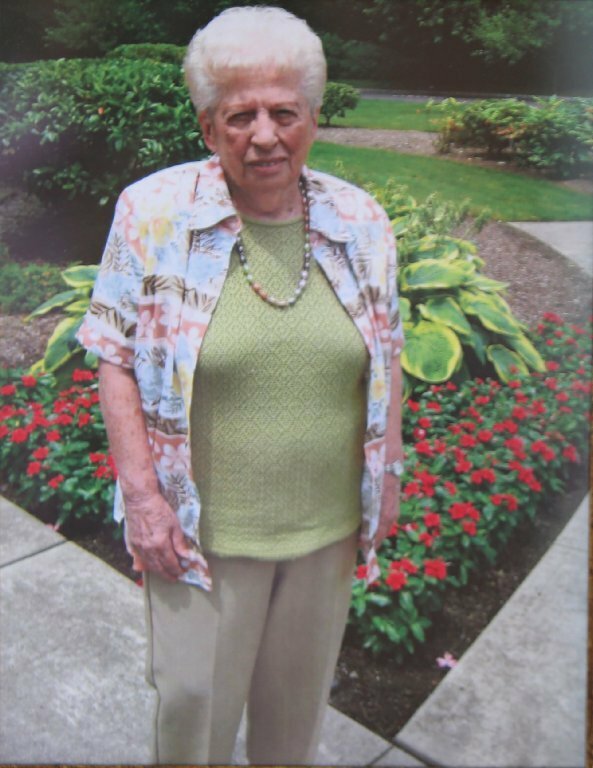 She loved playing cards and mahjong, and she helped with bingo at the Westfield Senior Citizens Housing. Ida’s health deteriorated in January. Following a short hospital stay after a fall, the grandmother of four was looking forward to her 96th birthday, which was later that week. But during a trip to have her hair done at a beauty parlor, Ida had a stroke. She went back to the hospital. She couldn’t move the right side of her body but she had “her full mind and spirit,” her daughter said. Ida soon went to a rehab facility for physical therapy. Ida returned to the hospital, and tests showed more bleeding on the brain. Doctors believed she had about a week to live. It was time for hospice care. The family decided on Center for Hope in Scotch Plains. Shaw visited Center for Hope to make arrangements on a Monday. The facility said Medicare would pay for Ida’s medical care, but the family would need to pay room and board, Shaw said. The cost was $390 a day, and she’d have to pay seven days in advance — a non-refundable $2,730. To reserve the bed, the seven days would start on that Monday, even though Ida wouldn’t move in until Tuesday. Shaw said she didn’t like the terms of the contract, but felt she had no choice. She signed, and she put the $2,730 on her mother’s credit card. Ida moved in on Tuesday, and she died on Thursday after two-and-a-half days of care. Shaw was very happy with the care her mother received, but she was unsettled about paying for days of care her mother didn’t receive. Bamboozled reviewed the contract, which states very clearly and in several places that the seven days are not refundable. The patient’s family needs to sign and initial several places to show they understand the billing practice. But Shaw said no one asked if they needed financial assistance, even though the rep knew her mother lived in a senior building where rent is income-based. Shaw said she never thought to ask for help. Shaw filed a complaint with Consumer Affairs and in March, she received a letter saying it would schedule the case for arbitration. But arbitration is voluntary, and Center for Hope never answered the state inquiry, letters show. The state said it had to close the case. Shaw next reached out to several legislators with a plea for new legislation banning hospice centers from charging fees for services not rendered. None of the legislators answered her letter. Shaw may have found the billing clause objectionable, but it’s not illegal. “There are no federal or state regulations about how [hospice facilities] charge patients for their beds, so it’s up to the individual hospice,” said Don Pendley of the New Jersey Hospice and Palliative Care Organization. There are only four such centers in the state, and Center for Hope runs two of them. 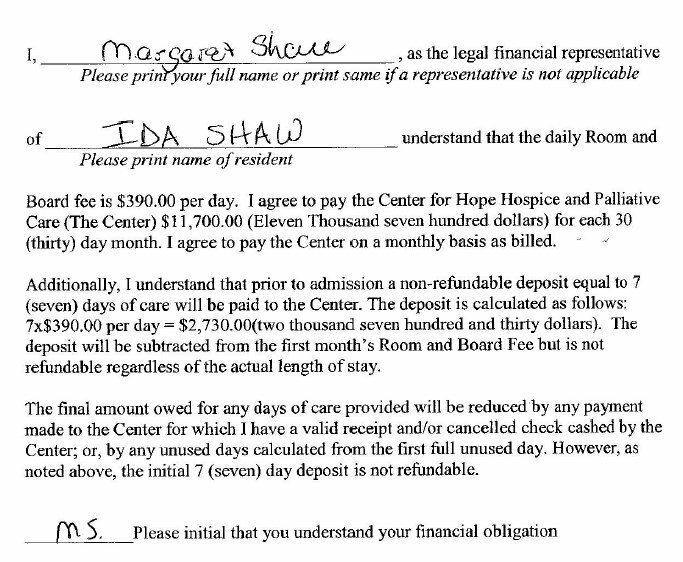 Karen Ann Quinlan Hospice in Fredon Township charges a non-refundable week upfront, and like Center for Hope, it doesn’t refund fees for unused days. Villa Marie Claire in Saddle River said it charges four days upfront, but it does refund the fee for any unused days. We wanted a bigger sample size for comparison, so we asked around to see what was the norm in the industry. “In our experience it is not common practice that room and board would be charged in advance nor have we heard that room and board paid in advance would not be refunded if the patient dies before the room and board prepaid period is up,” said Judi Lund Person of the National Hospice and Palliative Care Organization. And Dr. Joe Rotella, the chief medical officer of the American Academy of Hospice and Palliative Medicine, said he hasn’t heard of a facility that charges an upfront fee for room and board without providing a refund for unused days. 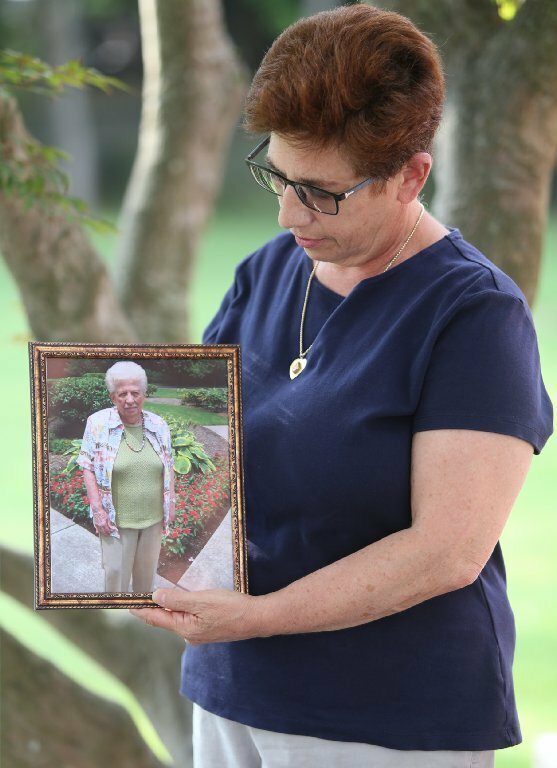 A federal audit turned up plenty of N.J. hospice workers whose health had never been screened before caring for Medicaid patients. Next, we reached out to Center for Hope to learn more about its policies. Representatives pointed out what we already saw: that there are many places in the contract that explain the seven-day fee. “We literally beg people in the document to read it carefully,” said Jeff Lampl, Center for Hope’s chief operating officer. Frank Brady, Center for Hope’s president, disagreed with the hospice experts who said the lack of a refund for unused days was uncommon. Asked about Shaw’s statement that she wasn’t told about charitable help, Lampl said that wasn’t true. Had Shaw said she couldn’t afford it, she would have been offered charity care, he said. He said Center for Hope gives an average of $2 million a year in free or reduced-cost care to those in need. “Based on the contract which was disclosed in advance, she is not due a refund,” he said. Assemblywoman Nancy Muñoz, one of the legislators Shaw wrote to, saw things differently. Her office said it never received Shaw’s letter, but it was very interested in her experience. Muñoz and state senator Tom Kean sent a joint statement to Bamboozled, saying they are both strong proponents of hospice care. Shaw said she was elated at the news. We’ll keep you posted on any new bills that are introduced.